Chemistry is the study of the composition of matter and the changes that take place in that composition. If you place a bar of iron outside your window, the iron will soon begin to rust. If you pour vinegar on baking soda, the mixture fizzes. If you hold a sugar cube over a flame, the sugar begins to turn brown and give off steam. The goal of chemistry is to understand the composition of substances such as iron, vinegar, baking soda, and sugar and to understand what happens during the changes described here. Both the term chemistry and the subject itself grew out of an earlier field of study known as alchemy. Alchemy has been described as a kind of pre-chemistry, in which scholars studied the nature of matter—but without the formal scientific approach that modern chemists use. The term alchemy is probably based on the Arabic name for Egypt, al-Kimia , or the "black country." Ancient scholars learned a great deal about matter, usually by trial- and-error methods. For example, the Egyptians mastered many technical procedures such as making different types of metals, manufacturing colored glass, dying cloth, and extracting oils from plants. Alchemists of the Middle Ages (400–1450) discovered a number of elements and compounds and perfected other chemical techniques, such as distillation (purifying a liquid) and crystallization (solidifying substances into crystals). Analytical chemistry: That area of chemistry that develops ways to identify substances and to separate and measure the components in a compound or mixture. Inorganic chemistry: The study of the chemistry of all the elements in the periodic table except for carbon. Organic chemistry: The study of the chemistry of carbon compounds. Physical chemistry: The branch of chemistry that investigates the properties of materials and relates these properties to the structure of the substance. Qualitative analysis: The analysis of compounds and mixtures to determine the elements present in a sample. Quantitative analysis: The analysis of compounds and mixtures to determine the percentage of elements present in a sample. The modern subject of chemistry did not appear, however, until the eighteenth century. At that point, scholars began to recognize that research on the nature of matter had to be conducted according to certain specific rules. Among these rules was one stating that ideas in chemistry had to be subjected to experimental tests. Some of the founders of modern chemistry include English natural philosopher Robert Boyle (1627–1691), who set down certain rules on chemical experimentation; Swedish chemist Jöns Jakob Berzelius (1779–1848), who devised chemical symbols, determined atomic weights, and discovered several new elements; English chemist John Dalton (1766–1844), who proposed the first modern atomic theory; and French chemist Antoine-Laurent Lavoisier (1743–1794), who first explained correctly the process of combustion (or burning), established modern terminology for chemicals, and is generally regarded as the father of modern chemistry. different from those found in nature. This form of research is known as synthesis. In many cases, analysis leads to synthesis. That is, chemists may find that some naturally occurring substance is a good painkiller. That discovery may suggest new avenues of research that will lead to a synthetic (human-made) product similar to the natural product, but with other desirable properties (and usually lower cost). Many of the substances that chemistry has produced for human use have been developed by this process of analysis and synthesis. Today, the science of chemistry is often divided into four major areas: organic, inorganic, physical, and analytical chemistry. Each discipline investigates a different aspect of the properties and reactions of matter. Organic chemistry. Organic chemistry is the study of carbon compounds. That definition sometimes puzzles beginning chemistry students because more than 100 chemical elements are known. How does it happen that one large field of chemistry is devoted to the study of only one of those elements and its compounds? The answer to that question is that carbon is a most unusual element. It is the only element whose atoms are able to combine with each other in apparently endless combinations. Many organic compounds consist of dozens, hundreds, or even thousands of carbon atoms joined to each other in a continuous chain. Other organic compounds consist of carbon chains with other carbon chains branching off them. 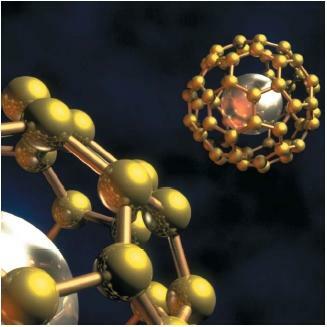 Still other organic compounds consist of carbon atoms arranged in rings, cages, spheres, or other geometric forms. The scope of organic chemistry can be appreciated by knowing that more than 90 percent of all compounds known to science (more than 10 million compounds) are organic compounds. Organic chemistry is of special interest because it deals with many of the compounds that we encounter in our everyday lives: natural and synthetic rubber, vitamins, carbohydrates, proteins, fats and oils, cloth, plastics, paper, and most of the compounds that make up all living organisms, from simple one-cell bacteria to the most complex plants and animals. Inorganic chemistry. Inorganic chemistry is the study of the chemistry of all the elements in the periodic table except for carbon. Like their cousins in the field of organic chemistry, inorganic chemists have provided the world with countless numbers of useful products, including fertilizers, alloys, ceramics, household cleaning products, building materials, water softening and purification systems, paints and stains, computer chips and other electronic components, and beauty products. The more than 100 elements included in the field of inorganic chemistry have a staggering variety of properties. Some are gases, others are solid, and a few are liquid. Some are so reactive that they have to be stored in special containers, while others are so inert (inactive) that they virtually never react with other elements. Some are so common they can be produced for only a few cents a pound, while others are so rare that they cost hundreds of dollars an ounce. Because of this wide variety of elements and properties, most inorganic chemists concentrate on a single element or family of elements or on certain types of reactions. organic and inorganic compounds and measure such variables as the temperature needed to liquefy a solid, the energy of the light absorbed by a substance, and the heat required to accomplish a chemical transformation. A computer is used to calculate the properties of a material and compare these assumptions to laboratory measurements. Physical chemistry is responsible for the theories and understanding of the physical phenomena utilized in organic and inorganic chemistry. Analytical chemistry. Analytical chemistry is that field of chemistry concerned with the identification of materials and with the determination of the percentage composition of compounds and mixtures. These two lines of research are known, respectively, as qualitative analysis and quantitative analysis. Two of the oldest techniques used in analytical chemistry are gravimetric and volumetric analysis. Gravimetric analysis refers to the process by which a substance is precipitated (changed to a solid) out of solution and then dried and weighed. Volumetric analysis involves the reaction between two liquids in order to determine the composition of one or both of the liquids. In the last half of the twentieth century, a number of mechanical systems have been developed for use in analytical research. For example, spectroscopy is the process by which an unknown sample is excited (or energized) by heating or by some other process. The radiation given off by the hot sample can then be analyzed to determine what elements are present. Various forms of spectroscopy are available (X-ray, infrared, and ultraviolet, for example) depending on the form of radiation analyzed. Other analytical techniques now in use include optical and electron microscopy, nuclear magnetic resonance (MRI; used to produce a three-dimensional image), mass spectrometry (used to identify and find out the mass of particles contained in a mixture), and various forms of chromatography (used to identify the components of mixtures). Other fields of chemistry. The division of chemistry into four major fields is in some ways misleading and inaccurate. In the first place, each of these four fields is so large that no chemist is an authority in any one field. An inorganic chemist might specialize in the chemistry of sulfur, the chemistry of nitrogen, the chemistry of the inert gases, or in even more specialized topics. Secondly, many fields have developed within one of the four major areas, and many other fields cross two or more of the major areas. For an example of specialization, the subject of biochemistry is considered a subspecialty of organic chemistry. It is concerned with organic compounds that occur within living systems. An example of a cross-discipline subject is bioinorganic chemistry. Bioinorganic chemistry is the science dealing with the role of inorganic elements and their compounds (such as iron, copper, and sulfur) in living organisms. At present, chemists explore the boundaries of chemistry and its connections with other sciences, such as biology, environmental science, geology, mathematics, and physics. 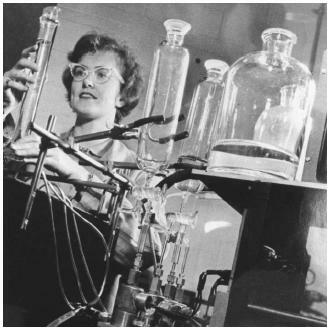 A chemist today may even have a socalled nontraditional occupation. He or she may be a pharmaceutical salesperson, a technical writer, a science librarian, an investment broker, or a patent lawyer, since discoveries by a traditional chemist may expand and diversify into a variety of fields that encompass our whole society. can give more information about this? Chemistry is Everything inside & outside us. It is what we eat, drink, breath, and handle.